Well, that was an experience in mass participation racing! 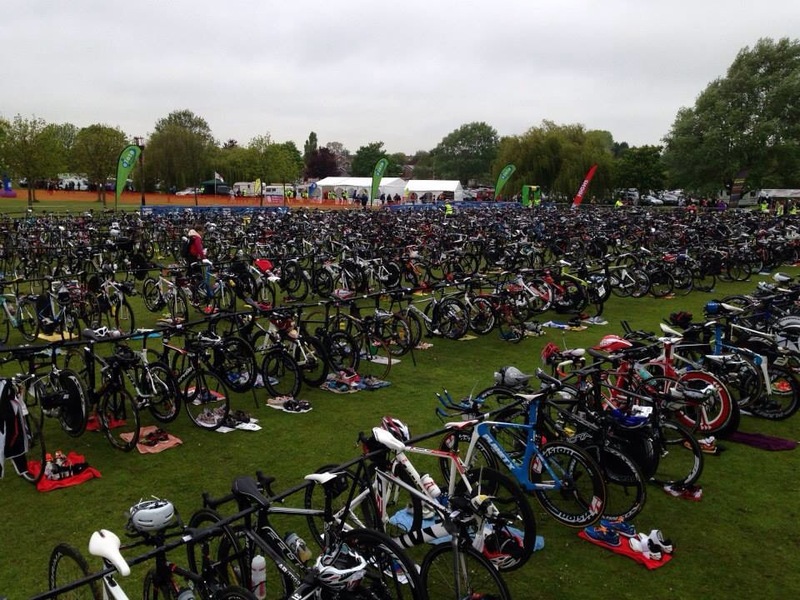 With around 800 other competitors I today competed in the NiceTri Sprint Triathlon in St Neots which as well as being the British Championships was a qualification event for the 2015 World Championships and the 2016 European Championships. For me, this was a race to see how I got on after winter training and to gain experience of racing at this level, so to finish 17th in my Age Group, with some solid split times, I was happy with the result. And as an added bonus my finishing time was within the % qualifying time to be eligible for roll down places in both of the Championship events, but no guaranteed qualification spot. Given the level of the race I was remarkably calm before the race and was looking forward to taking part in such an event – that was until we set off on the swim! Oh my word, I have never experienced such a fight in the water before and a couple of times I really did fear I would drown. The swim was in the river, 750m in total with a swim downstream then back upstream. It felt warmer than my recent dips in the local lake, but at 13degs was still feet and hand numbing. A mass start, I positioned myself a couple of swimmers back, but not too close to the rear as I didn’t want to get held up. The claxon went for the start and it was chaos, I was swam over numerous times, punched, kicked, held under the water and got my goggles knocked off, I couldn’t swim myself out of trouble as there was just nowhere to go. Then most of those who swam over me at the start, slowed down, but I couldn’t get past them as there was no room. It was pretty much like that until we had turned around the 2nd bouy and started heading back upstream, when I finally found a bit of space and could concentrate on my swimming and finally started to overtake people. Swim exit was pretty smooth and I found my transition spot with no trouble. Unfortunately a combination of the cold water and swimming like I was in the sea meant I’d lost my land legs and felt sick from the dizziness and swallowing water so getting out of my wetsuit and into my bike shoes proved to be a very slow process. The bike leg was pretty uneventful and with lots of other cyclists out on the route I pushed hard and the 25k route went quickly. Then it was out into the park for a 2 lap 5k run (turned out to be 4.8k). I couldn’t feel my legs (after the bike) or feet (from the cold) so the run was a case of putting one foot in front of the other as quickly as possible. The terrain was a mix of grass and footpath and I was really tired by now but turns out that I had a cracking run, doing a time I would have been happy with as a stand alone 5k, finally my running seems to be coming back to me. A great race and really well organised by NiceTri with everything running smoothly and a feeling of friendliness throughout – shame they couldn’t have widened the river though! 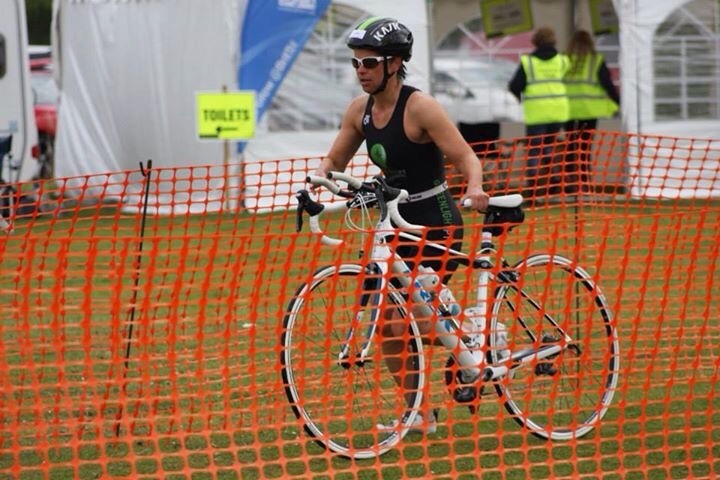 I’ve now been coached by Adam of GreenlightPT for a year which has seen me improve in my swim, bike and run times and I feel like I’ve only just got started and will hopefully improve further still as I gain experience in triathlon racing and get fitter and faster. We’re now into the Triathlon season and over the next 8 weeks I have 2 more qualification events (hoping to improve my placing for one of the 6 roll down places), a 10k river swim and the European Aquathlon Championships in Cologne – it’s going to be a busy start to the summer!